TV has long struggled with how to handle teenage characters growing up. Eric (Topher Grace) was all set to begin his freshman year on That ‘70s Show until his father had a heart attack. Even though Alex (Ariel Winter) and Hayley (Sarah Highland) graduated from high school and headed off to college on Modern Family, they are both somehow still at home. Kids growing up presents a unique problem for TV series, which might not be sure how to work in a whole new story line—and may be tempted to avoid it altogether. And yet, in the Season Five premiere of ABC’s comedy The Goldbergs, eldest daughter Erica (Hayley Orrantia) heads off for her freshman year of college, much to the chagrin of her loving but overbearing mother, Beverly (Wendi McLendon-Covey). But will Hayley stay at college? “I’m still not sure how exactly they are going to play it,” McLendon-Covey adds. “Because in the actual Goldberg family, there was an episode that occurred in college that necessitated the leaving of college.” But for now Erica will remain in her very messy dorm room. The Middle sent oldest son Axl (Charlie McDermott) to East Indiana State University four seasons ago. Now Axl is a college graduate just back from a European trip (check out his man bun in the season premiere on October 3). “I was scared, to be perfectly honest with you,” Eileen Heisler, executive producer of The Middle, says on the decision to have Axl live out of the house and at college. “But it was important to us that there will be some success in the family. We wanted Axl to go off into the world. We felt it would be a contrivance to not let him go.” Middle sister Sue (Eden Sher) followed him to college two seasons ago, opening up even more storytelling possibilities—including Axl’s increasingly awful housing. Heisler, who sent her own twin sons off to college for the first time just a few weeks ago, says raising two boys helped inform Axl’s living situation. “You just have to be a kid observer and know boys are disgusting. I live intimately with them and take it from there,” she says with a laugh. 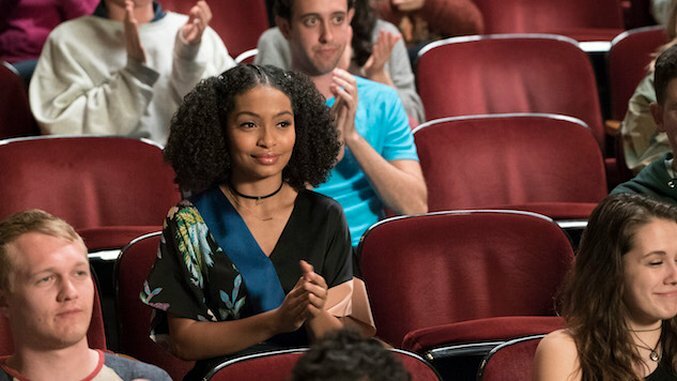 black-ish added a baby to the family at the end of last season (that’s an article for another time), and the juxtaposition of one child leaving the nest while one child is born is great storytelling fodder.